I don’t know what it is, the age of our plantings or the weather, but this has turned into the most beautiful spring ever in our southern California yard and garden. I am utterly enthused about our prospects for a great harvest this year. A series of gentle rainstorms blew through earlier in the week, and I got outdoors between sprinkles to photograph the yard in all of its spring glory. 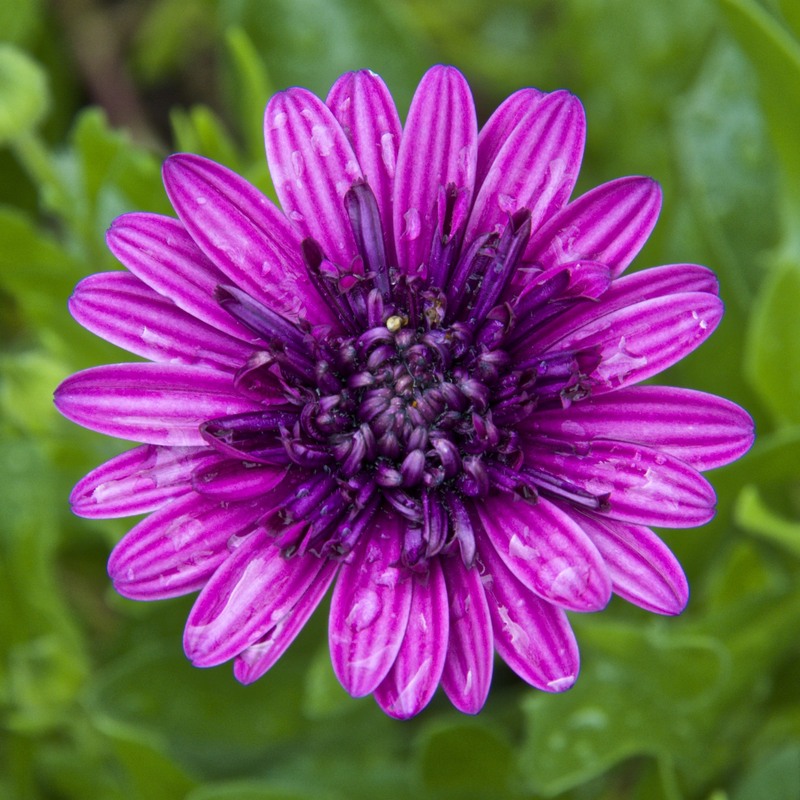 I have a couple of varieties of Osteospermum, aka Freeway Daisies. 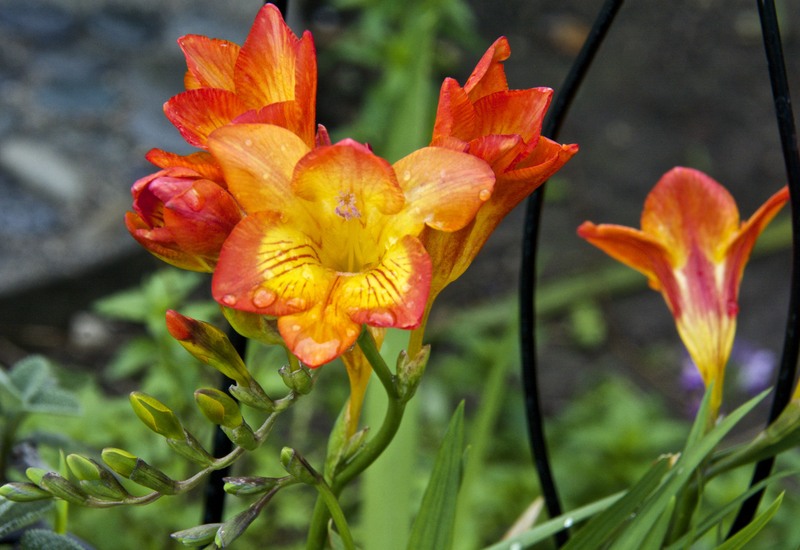 They are beautifully drought tolerant and bloom much of the year. But first, an explanation of why I call my blog my Green World. It isn’t just because I grow organic fruits and vegetables and keep chickens in our small urban yard. As environmentalists, we live a green life with composting and collection of rain water. We conserve energy and water, and do what we can to reduce our carbon footprint to combat global warming and climate change. This is our main rainwater collection area–three rain barrels hooked in series under a downspout, plus an over-flow barrel. We had a gutter and downspout installed on the north side of our house for the express purpose of saving rainwater. When the three barrels in series are full, I put a diverter in place to collect yet one more barrel of water. When it isn’t actually raining, I keep lids on these Rubbermaid trash barrels to keep mosquitoes out and prevent water loss due to evaporation. I also use Bt in the water to kill any mosquito larvae. I use a watering can to take water from the barrels to my veggie beds and potted plants. I can empty many of the barrels several times over a rainy season, with rain dripping off the eaves putting water back in with each storm. This is the rain barrel in the front yard. 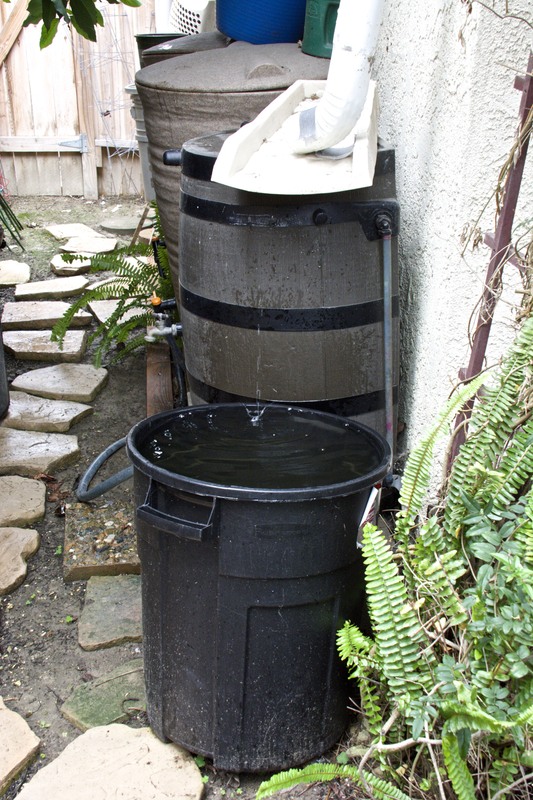 In addition to the four large rain barrels, we have 7 Rubbermaid trash cans that collect dripping water from the eaves. 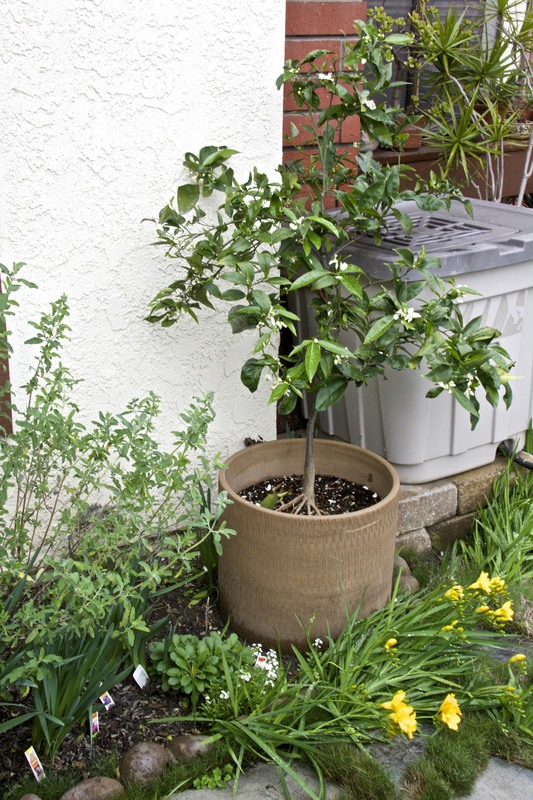 And check out my dwarf Valencia Orange tree in a pot. It is in magnificent bloom. 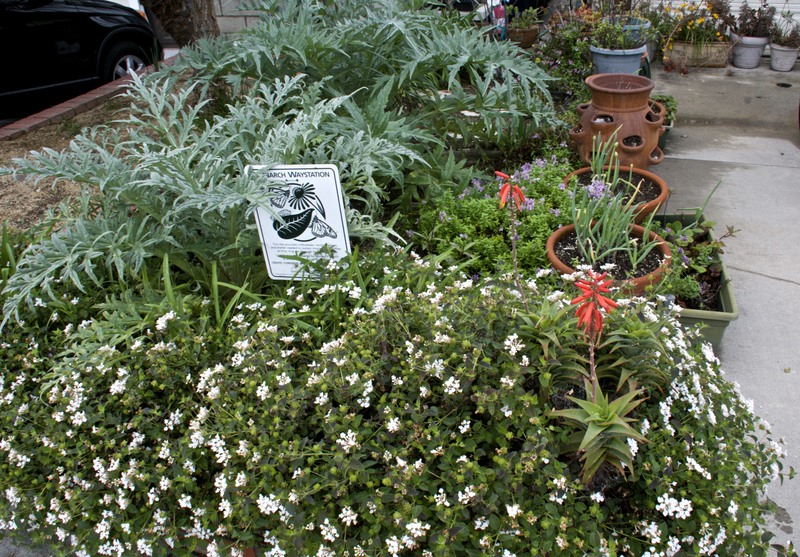 The flower border by the front walkway has freesias, cobbity daisies, petunias, and freeway daises in bloom. It also grows marjoram and oregano. Edible landscaping! 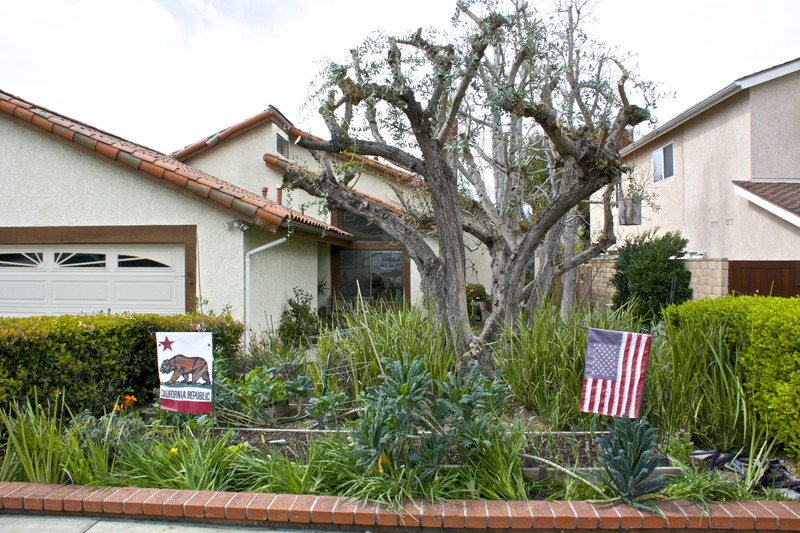 Here is a different view of the front yard. Because the house sparrows have been eating my vegetable garden, I have replaced the bird feeders with baskets of flowers for pollinators. The bees LOVE those flower baskets. 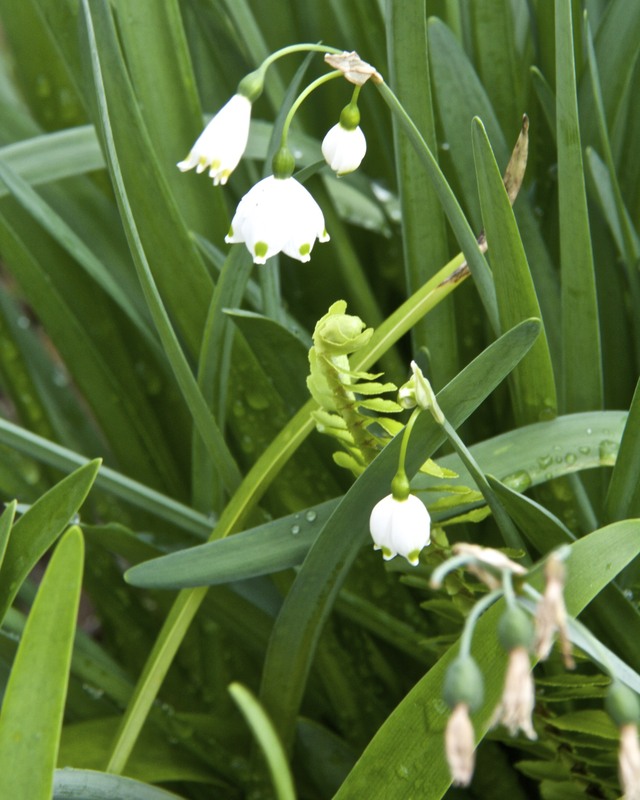 These snowdrops are nearly finished blooming. And the paperwhite narcissus were through blooming long ago. 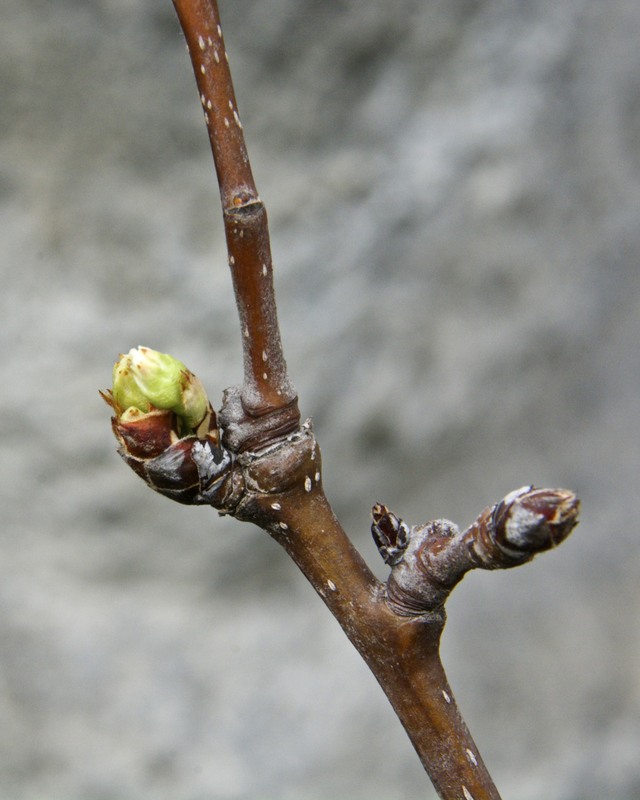 The first flower buds on my grafted Asian Pear tree show promise in this photo from Sunday. They opened up today. 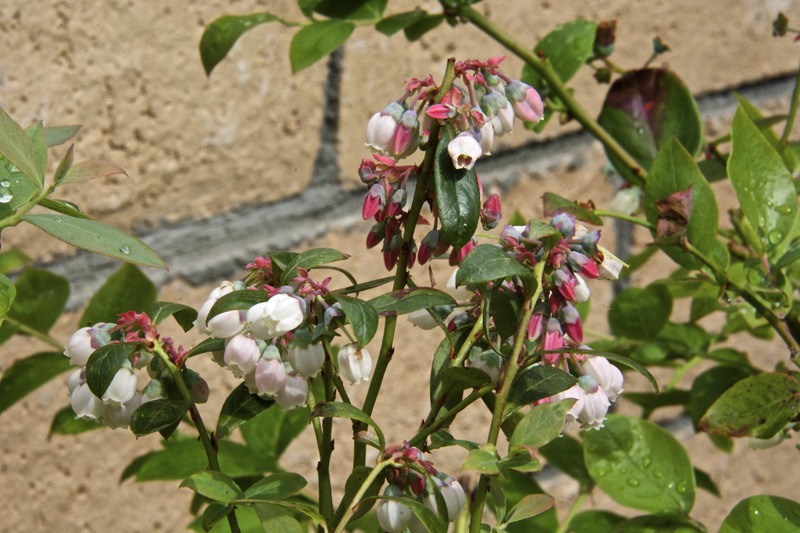 I bought some blueberry bushes this year. Maybe we will beat the birds to the berries. Maybe I will be smart and cover them with bird netting. Maybe I will get around to actually planting the bushes. 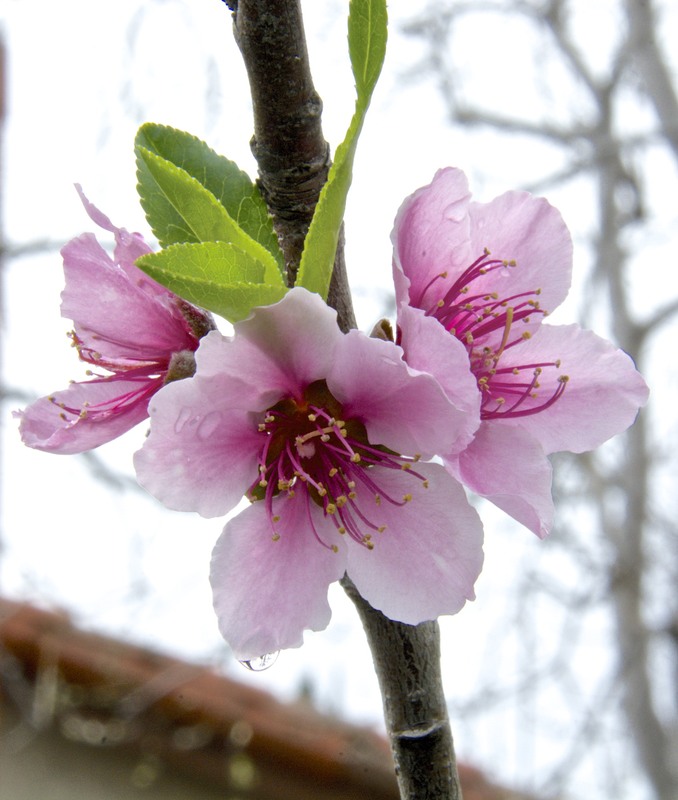 This semi-dwarf peach tree is supposed to be an August Pride, but since the peaches mature every May, I think it is a May Pride peach. At any rate, it didn’t get many chill hours and produced only 19 blossoms this year. 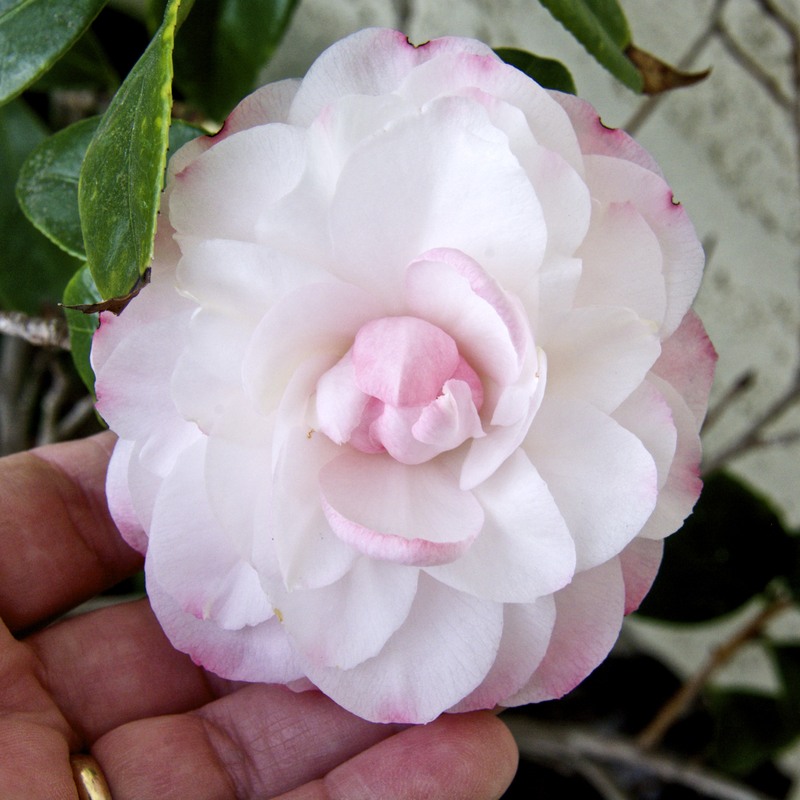 My camellias have never been prettier. 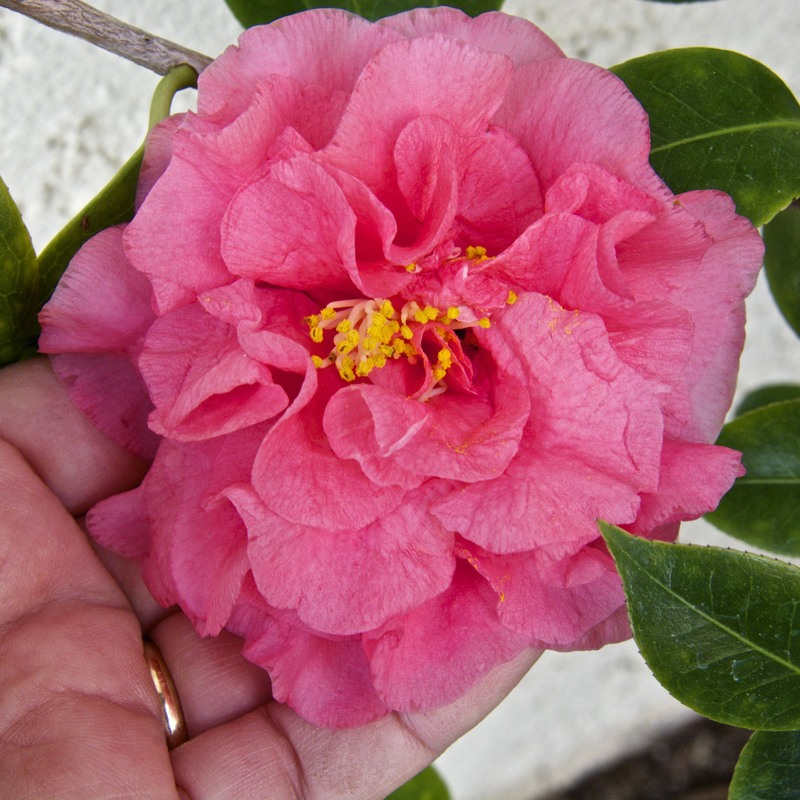 This camellia bush has more flowers on it than it has ever had before. This is a view of our front yard from the street. My longest veggie bed is in front, right by the sidewalk so passersby can enjoy looking at it. No one ever takes anything, and I think it is educational for people to see vegetables growing. This is a long view of the raised veggie bed in front. 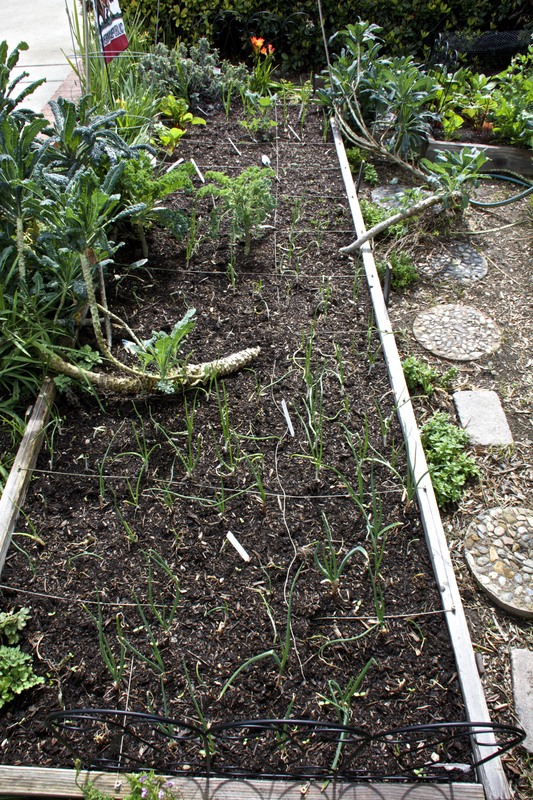 Onions are in the foreground, then kale. These Scarlet Nantes carrots sprouted, but I had sown them too densely. 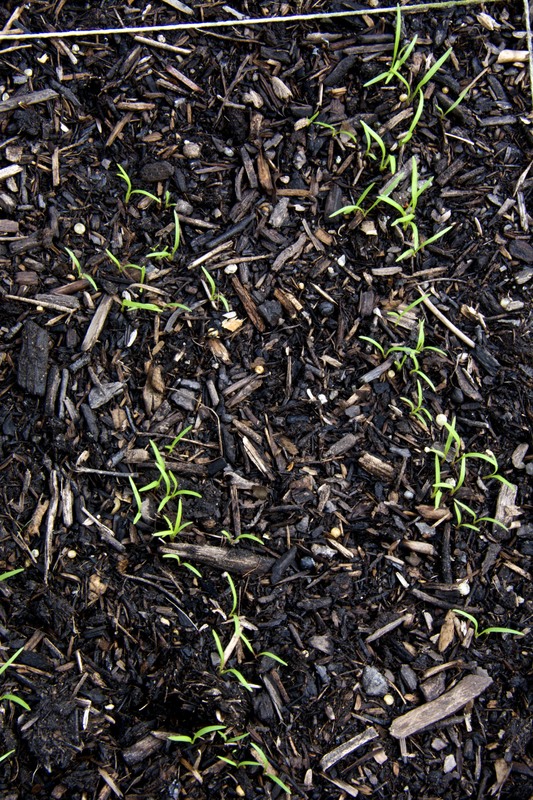 I transplanted many of the tiny seedlings yesterday and ended up with about 60 carrots. 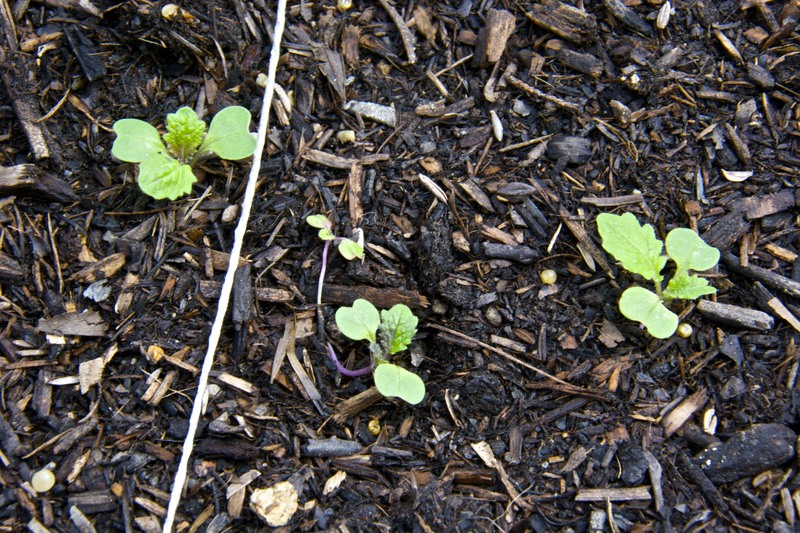 The Purple-top Turnips sprouted quickly. They were also too dense, so I transplanted them last week. I ended up with 25 turnip seedlings. Different vegetable, same story. 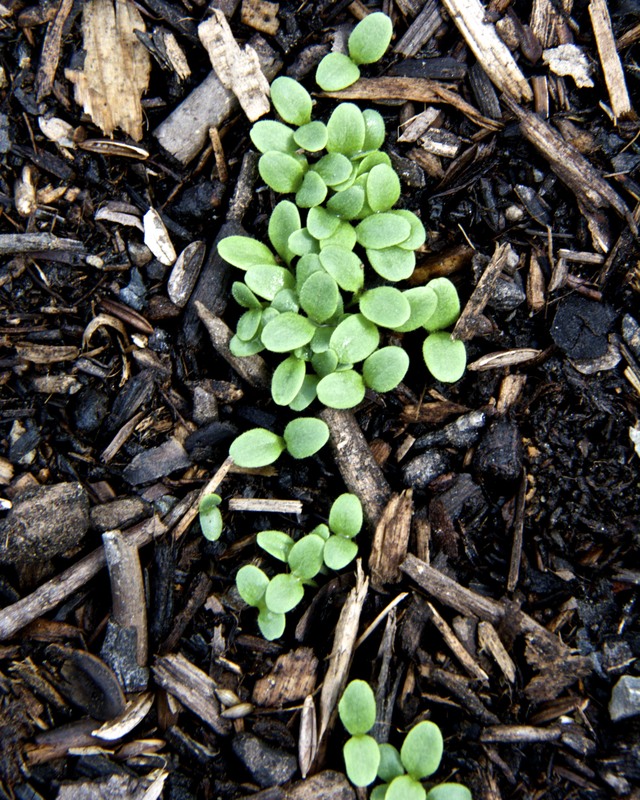 I sowed these Deer Tongue Lettuce seeds too densely, so I transplanted about 2 dozen. I don’t need more lettuce than that, so I plan to harvest this unthinned row as micro greens. It seems that a new garlic clove sprouts every day. 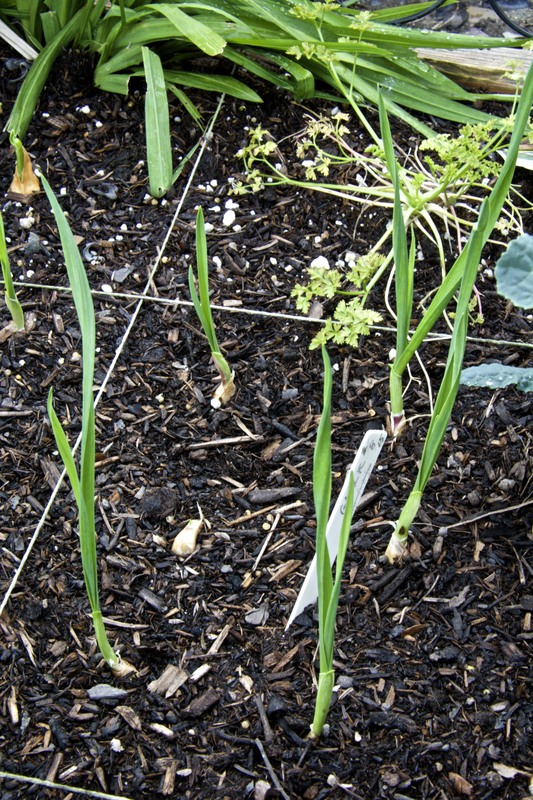 I now have 23 out of 27 garlics sprouted, plus one elephant garlic. What am I going to do if they all make garlic heads? I built this smaller raised bed behind the long one in front. It has Rainbow Chard, arugula, bok choy, and Frilly Red Mustard in it. Our Lacinato (aka Dinosaur) Kale is in its third year and flopping all over the place. The harvestable kale is now blocking my pathway. I just step over it. All of this is kale from ONE plant. The freesias are in full bloom and so aromatic. Delightfully sweet smell. 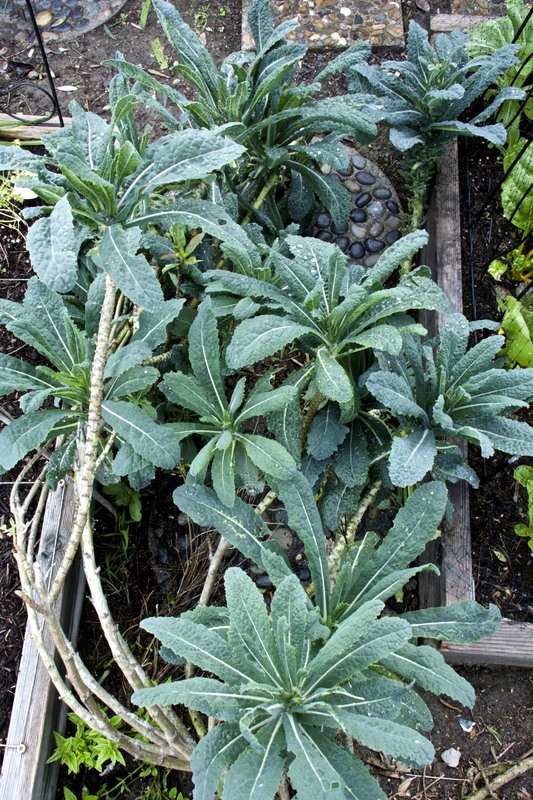 The butterfly garden has artichokes for us, as well as a dwarf apple and a struggling persimmon tree. I grow green onions in pots. It works pretty well, and we almost always have green onions to harvest. 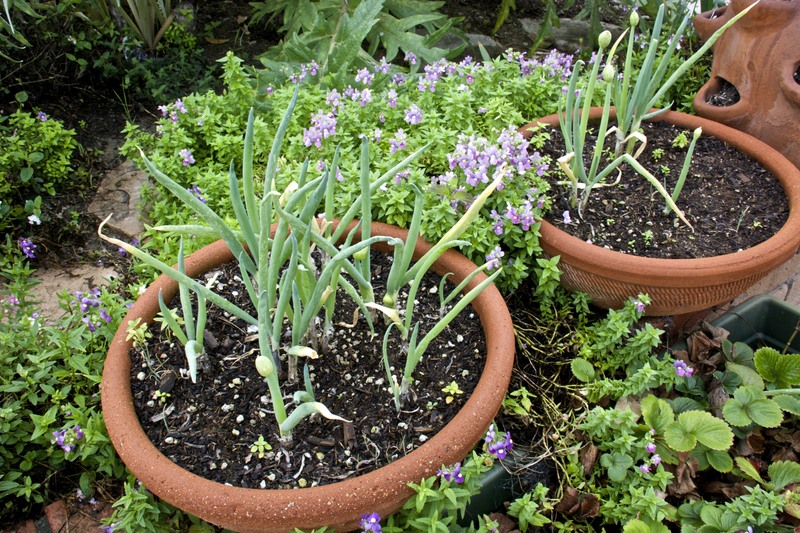 I think it is time to sow another pot or two because I’m running low on green bunching onions. You can see a bit of one strawberry planter at the bottom right. And this is only the FRONT yard. There is more in back, like most of my fruit trees, three raised veggie beds, and the chicken coop with four hens. But I see it is late in the morning and I need to go to work this afternoon. I work at the Orange County Conservation Corps, where I teach conservation awareness and field safety to the newly hired crews before they go out to the field. I only work one afternoon every other week, but I love it. I like hanging with my homeboys (and girls). They are mainly male Hispanic gang members ages 18-22, often on probation. They come to the corps to earn their high school diplomas while working on conservation projects. Best work I’ve ever done. This entry was posted in Uncategorized and tagged artichokes, flowers, green onions, Orange County Conservation Corps, peaches, seeds, spring, thinning, turnips. 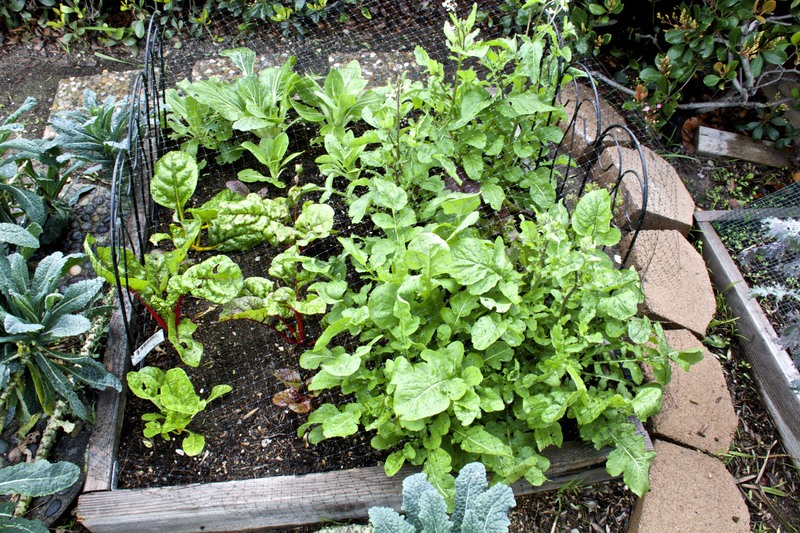 lettuce, urban chickens, urban homesteading, vegetable garden. Bookmark the permalink. Tonie, I post my spring pictures to give those of you in the still frozen North some hope. Spring will come to you too. Just let the earth tilt a bit more and you’ll have it. If my kale were three years old it would have so many aphids on it. I like that the aphids die over the winter here. They wouldn’t where you are. Daphne, you’re right, my kale is loaded with aphids. Thanks for a beautiful and happy post. Sure cheered me up. One more night of single digit temp, starting tomorrow we will be in a heat wave, daytime temp will be in the 30’s and low 40’s and nighttime temp will be double digit. Hope your persimmon tree do well for you. Courage, Norma, spring is coming your way soon. Thanks so much for the garden tour, the flowers and veggies are beautiful! I should grow some Freeway Daisy flowers for my desert garden. 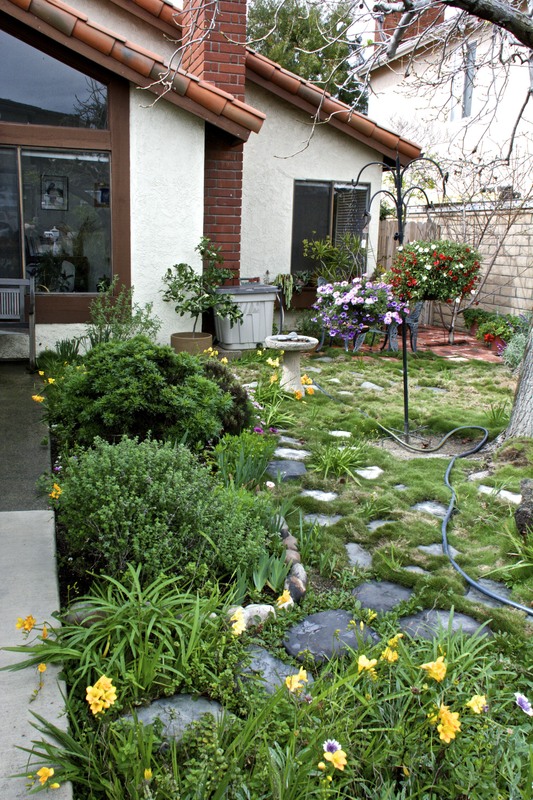 It’s too bad our front yard is xeriscape (mandatory per HOA) I cannot grow any veggie there, otherwise I would stick some alliums here and there since they do not require much attention. Mac, I have had good luck growing things in pots in the front. I save rain water in barrels and do a lot of watering of pots with that. But it doesn’t last all year. 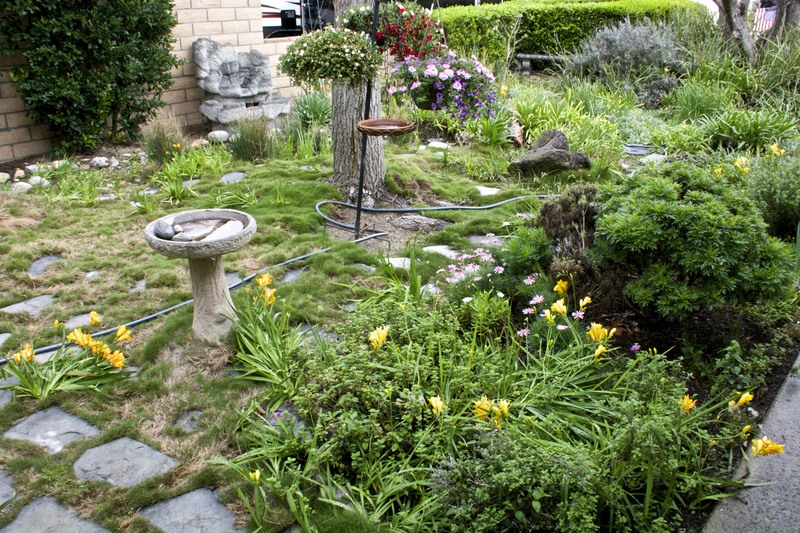 California is about to have mandatory water rationing, so I will see what that does for us. We use about a third of what the average California uses, so I hope they don’t expect us to cut even more. Lou, thanks for that cheerful garden tour. Your pictures are great. I noticed the base of your dwarf orange is exposed slightly. Mine is covered with soil/mulch and doesn’t seemed to do as well as yours. Should I expose more of the trunk base? TioChris, I just added more soil to the base of my orange tree. I think the secret was fertilizer. I used EB Stone organic fertilizer for fruit trees last year and my trees love it.